Liquid Pool Covers - Online Photographs - the 2014 method of "Window Shopping"
Perhaps you've heard the saying, "a picture is worth a thousand words." Or, "take a picture, it'll last longer." 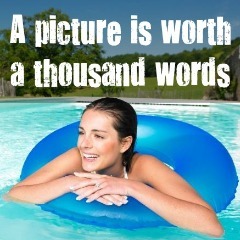 We all know that pictures provide impact and a lasting impression. In our modern, internet driven society, this is becoming more and more true each day. If you spend any time online, or watch over the shoulders of the teenage members of your family, you will find an impressive array of websites dedicated to pictures - Pinterest, Instagram, Buzzfeed, Imgur, Houzz, and so many more. Other social sites like Facebook and Twitter are often dominated by pictures as well. Websites that don't have a healthy ratio of photographs to words will often be passed over. Pool Builders have been showcasing their designs through photography more or less since the age of personal cameras began, but more and more Service Professionals and Retailers are expected to join this trend as well. You may think that sharing pictures of your retail store will have nowhere near the impact on your business as sharing photos of the most recent stunning pools that have been built, but you might be surprised by the reception your images receive. I would like to toss out the theory that browsing through photos online - of your retail location and / or the products you sell - is the new method of window shopping. Consumers don't even have to leave home to browse your shelves anymore, but if they see something they like, they will certainly get off the couch and come visit you. Personally, I often browse websites before going shopping. It helps me narrow down the list of stores I want to visit while I'm out. If I find a website that has a few items I am interested in, or a Facebook page that has staff that look like they have a lot of fun at work, I am much more likely to take the time to get into their store. The great thing about how easy it is to share pictures these days is that internet browsers are not looking for stunning photography. We expect to see pictures captured on a smartphone, filtered through Instagram, and posted with a clever caption. Not an expensive, staged display. We're looking for real life. Any anyone can do that at no cost! If you haven't yet started snapping pictures of your business, think of it as the 2014 season starts to warm up. 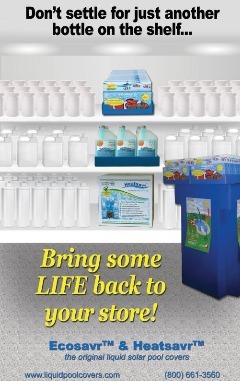 If you snap any pictures of Ecosavr on your shelves, be sure to let me know - I'd love to share them with my audience as well!